If the spring is the time for finding love, summer is the time for keeping that relationship going, moving to the next stage. Even though all the good words are better said in person rather than via some digital device, modern people travel a lot, and couples need to stay connected at all times to feel the love. Mobile devices can help you keep your jealousy tampered, knowing your beloved does what he/she says is doing, so that you never need to address the Cheaters for the proof. Either way, the following apps can positively contribute to love relationships, so here is our list for the day. Price: Free and paid versions are available. Can a mobile app prevent cheating? Couple Tracker Phone Monitor is a mobile app for couples designed to bring transparency into relationships where trust is questioned. It allows couples to exchange and share text messages, call history, GPS location history, Facebook messages in real time. The catch here is the sharing must be mutual. In this respect, mutual monitoring might be viewed as cheating prevention for couples. 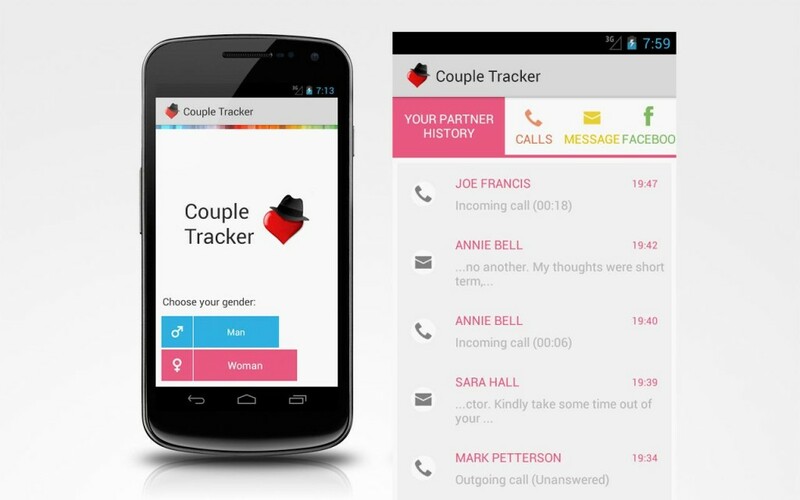 The developers of Couple Tracker app have released an Android application, while iOS version is under development, so by now it only works for couples where both spouses use Android smartphones. Both of you will need to install Couple Tracker and connect your account to that of your partner. Voilà, now you have access to your partners phone calls, text messages, Facebook records, as much as your partner can see yours. It is impossible to hide the application, since you will be receiving permanent notifications in real time. The “trust system” reveals to your partner only the initial 50 characters of every text messages, call history and Facebook communication, so it’s not like you are reviewing everything from head to toes. Seems like a fairly just exchange; the app is active 24 hours a day and offers a real-time overview of your partner’s mobile activity. GPS locations are recorded and saved with 30 minutes intervals, then archived and are available as a shared database for the consecutive 2 weeks. Both partners will be able to see Facebook chat statistics with the contacts names and number of messages daily; both partners will see the last message of every Facebook conversation. The developers claim deleting text messages and call logs won’t help because Couple Tracker works faster. You cannot use this app to spy on your partner because it only works when two accounts are interconnected. Users report the app helps them waive jealousy concerns, the con here being the absence of iOS version that would be compatible with Android counterpart. This app was created with privacy in mind – it allows you to share private photos with your partner. The app does not offer a contact list because you are only supposed to have one contact to send your personal images to; it also offers a lot of cool filters and effects. The best part is it secures your sharing, so no unauthorized third-party gets hold of your images. Filter effects include sepia, lomo and retro, which are not inferior to those of Instargram, Vignette or Hipstamatic. 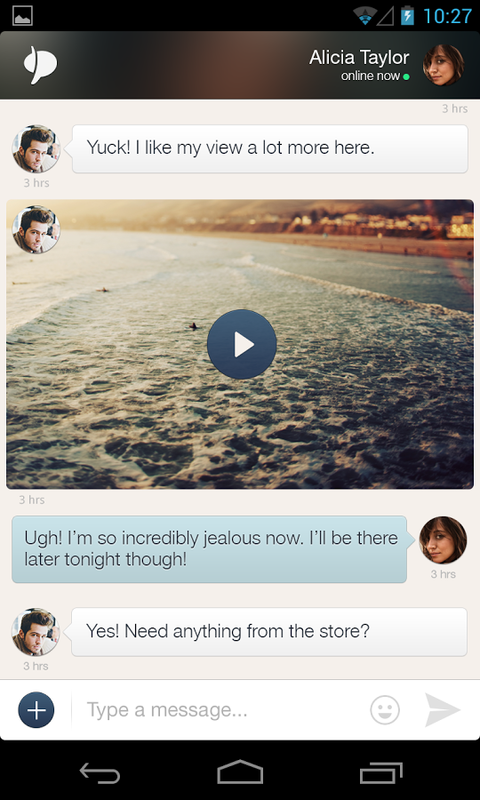 Instant messages will notify whenever a new photo or comment arrives. 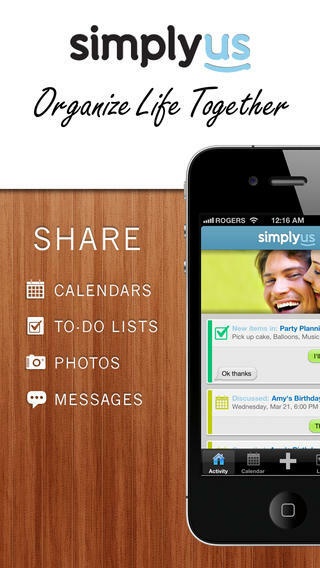 This is a fun and easy app for couples looking for a streamlined way to share personal images. This application was designed with privacy in mind, and it offers a private space for you and your partner to chat, share images and store facts and memories in the timeline available only for the two of you. Besides giving you the opportunity to share and chat, LoveByte suggests interesting date ideas in its default lists, so you can choose one and share it with your partner in a fun scratch card, so your beloved one will keep guessing while scratching the surface. 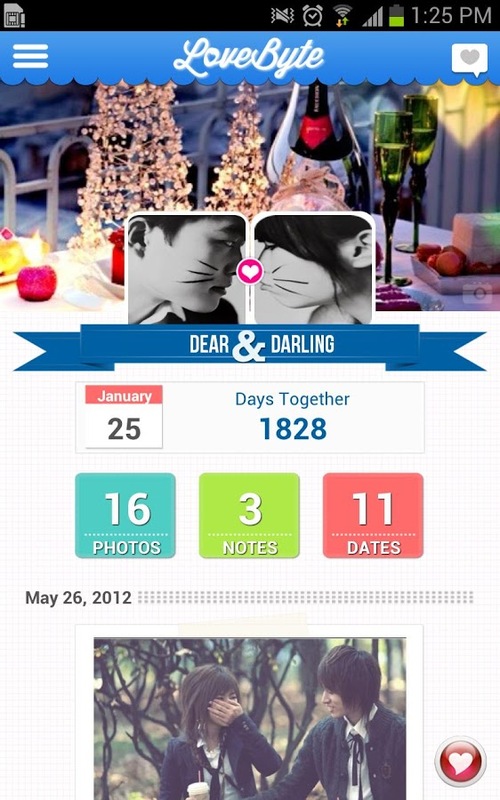 The timeline in this app is customizable, and users can choose which photos or events need to be posted as a milestone in their relationship. Secret message feature creates a private chat room where you can exchange secret messages, photos, adding a little bit of surprise effect to the conversation. For moments when words don’t come easy, you can use the notes feature to create a sweet message to your partner. The Dates feature will be useful for the male partners who always have trouble memorizing those special anniversaries and birthday dates and get in trouble when they forget the dating anniversary, while some women want to celebrate the date every month, so the little reminders will help you remember those special dates. 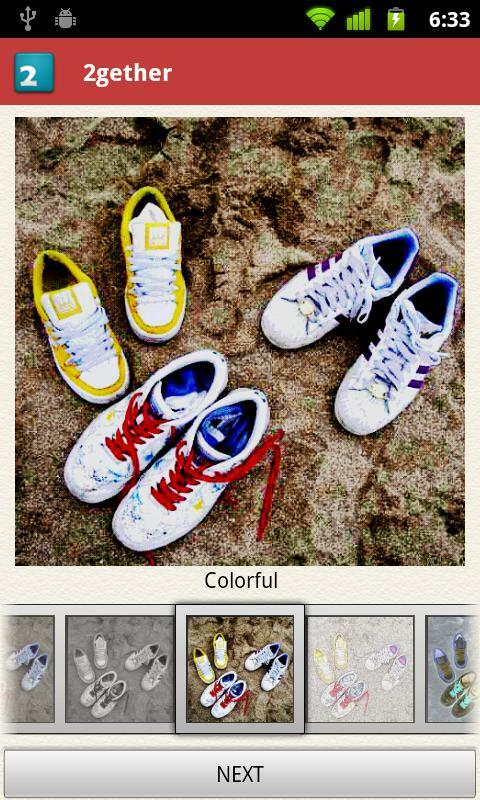 It can create customizable photo albums and record your happy moments together. The developers claim this application will remind you why you fell in love in the first place, which seems kind of funny, but may be useful for the younger folks. This one is a simple, yet functional memo widget – enter the date your relationship began, or your wedding day, and Love Widget will continuously display how old your relationship is; great for the forgetful men and meticulous women. Thus, the widget will remind you of important upcoming anniversaries. 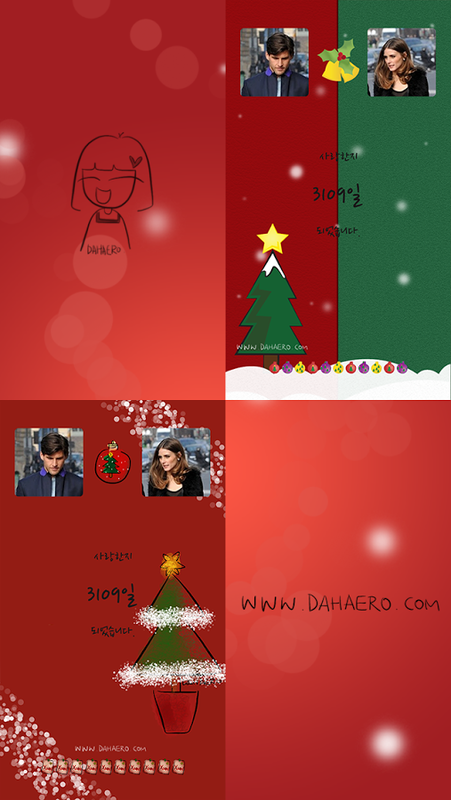 Voila, it’s a simple way to remind you of that special day in a specifically dedicated home screen widget. This Android app is similar to the above mentioned love widget – it keeps track of your anniversaries and big dates and milestones in your relationship. It also has a widget, so you can place it on your home screen and keep a close eye on the days and years counting. You can customize the app’s interface with your own images and names, changing backgrounds, setting up notifications for multiple anniversaries to be displayed on the side menu. The app also allows you to share things on Twitter and Facebook. Even though the developers of this app claim avocado trees only grow in couples, I failed to find this information online on websites other than those promoting the app itself (the trees are both self-pollinating and many a case need pollination, so they best grow in groups). Nevertheless, we get the idea why the developers chose to name their app Avocado. This is a secure environment for couples to stay in touch – share images, calendar entries, text messages and a lot more. Avocado features secure instant messaging, photo sharing, photo sketching, creating of shared lists, which is especially useful for married couples doing shopping. You can also share the calendars to schedule vacations and appointments, as well as send your loved one a virtual kiss and hug. The best part about this app are the encryption and advanced security features that enable you to protect your personal communication. You can archive your relationship to be able to retrospect whenever you need to. The app works great on both smartphones and tablets, or as a web service. You can send pictures and text messages with personalized “photocons” – expression of your face in a snapshot instead of the yellow-faced emoticons. Additionally, you can create custom notes so that whenever you need to send that love message, you can easily access that “I love you” or “see you soon” message. You can also share posts on Twitter as a couple, besides the app has an appealing and intuitive user interface. Couple is a free and fun tool to intimately share the best moments of your life with your partner and stay in touch in a secure environment. It is the app for two people only and allows you to send your text messages privately, which is perfect for long-distance relationships. You can also share images, the video and audio recordings, stickers, share to do lists and locations, set reminders and make phone calls together, and use ThumbKiss feature which makes your phone vibrate when you touch the same spot on your screen simultaneously. There are fun sticker packs you can buy via in-app purchases from one end only – your partner will immediately be able to have access to it. Another nifty feature of Couple is you can send private photos and schedule them to get deleted after a fixed time. You can do a lot of stuff simultaneously in the application – sketch pictures, play games, and make phone calls. Your synchronized to do lists will be immediately available to both of you, which is great for groceries shopping. Calendar reminders will help you stay aware of your anniversaries, birthdays and other important dates, while Live Beacon will help you broadcast your location in real time to each other to help you meet up easier. The app supports both Android and iOS devices, while you can also use the web service for chatting online. This is a great app for the obsessive folks who need to stay connected to their loved ones at all times. However, the best part about it is you can do a lot of things together simultaneously, even if you are physically apart. 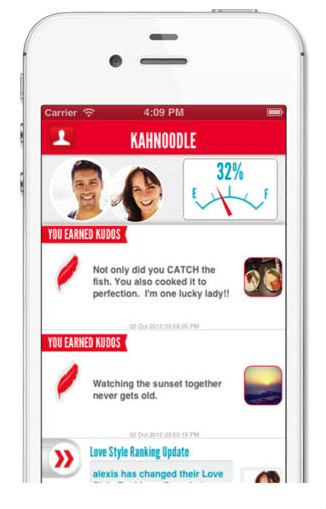 Kahnoodle is the app for couples who would like to get reminders for anniversaries and special tips that will help them make their partner happy. The application relies on your location to search and discover interesting and affordable date ideas available in your city. The app also incorporates kudos to thank your partner for washing dishes, or create love coupons your partner can claim on special occasions. You can also create wish lists for things you would like to do together or places you would like to go, as well as send your partner direct messages. This application makes work on your relationship an interactive game, where you can rate love signs of your partner or point at things you would like him/her to do for you. This might rekindle the fire in your long-term commitment and point to your loved one about the issues that need to be addressed. Nevertheless, the greatest part about this app is you can get local deals and suggestions for your next date out. Users point out this application creates a perfect timeline of things you did for each other to have documented proof that you are contributing to the relationship. Nevertheless, if it comes to documenting your contributions to the relationship in any way, including the digital, it might as well be the beginning of the end. This might not be the funniest application for couples, but when used properly, it can help you let your partner know how much you appreciate them. IceBreak sends you customized suggestions and ideas designed to enhance your relationship, irrespective of whether you are married, engaged, dating or just starting out. You can share text messages, photos and sketches in the private and secure environment created just for the two of you. With the app’s suggestions and tips, you can significantly enhance mutual understanding and communication by answering the app’s questions called icebreakers. Additionally, the app allows you to connect with the icebreakers community to discover what other members think about popular relationship topics. “Relationship score” allows you to keep an eye on the health of your relationship, even though I wouldn’t rely on that. This is a great app to help couples get to know each other better through answering important questions, as well as sharing pictures and other memorable memories via the app. Love Maps was created to help partners keep track of important milestones in their relationships, organizing all the important information about your life events, aspirations and all the things that matter for each of the two. Love Map comprises your beloved’s dreams, aspirations, daily events, memorable events and all the things that are important to them. The app will ask you about 86 questions to create each couple’s love map. Crafted by marriage experts, it was designed to help you understand your partner better through reminding each other what really matters to you. This app is especially advisable for couples where men seem to be lagging behind women in knowing what makes their partner tick. The app helps couples be aware of what interests and really worries each spouse. This is more of the serious app, with psychological roots, rather than the fun and sharing features of Avocado and Couple. The app helps couples organize their activities together in a private environment helping them stay close and organized. This app is great for the meticulous folks who like to stick to calendars, to-do lists, and notes when organizing things and events. At the same time, it is very useful for workaholics with busy schedules, and large families with huge grocery and gifts shopping lists, chores, checklists and reminders. This app helps families and couples stay organized, plan and do things together. Simply Us is compatible with Google, Hotmail, Outlook and Yahoo calendars, and you can choose which items need to be shared and synchronized with your family members. 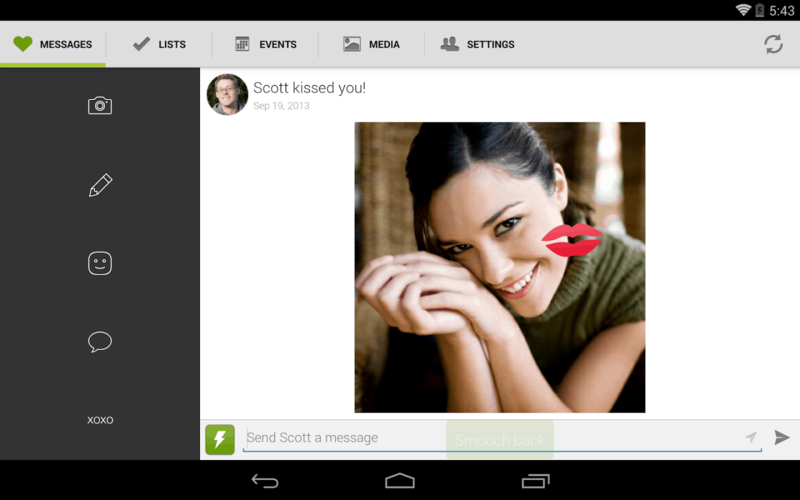 You can also share private images and text messages with your loved one. Without unnecessary fuss and beautifying cuteness characteristic of adolescents, this app is more of a productivity app for busy couples. Don’t get misled by the name, because this app allows you to connect to your partner via your device’s screen – you will see the taps of your partner on the screen, so you can touch the same spot simultaneously. Once that happens, your device lights up and vibrates, which is particularly cool for those who are committed to long distance relationships. The app is still under development, but you can check out the developer’s website for the release date.